This past weekend I had the unexpected pleasure of trying what just may be the best ribs in Miami. Big Ship BBQ stands out with their HUGE BBQ smoker (appropriately called Big Red). They serve a mean slab of ribs with just the right amount of kick to ’em and a tinge of sweetness. I had the baked beans and potato salad as my sides and while both were good, the beans win my acclaim. I lean towards the sweeter things on my plate. In addition to ribs, Big Ship (that’s the proprietor’s name as well) also serves a chicken dinner. It looked delicious and I’ll have to give it a go next time around. Big Ship and his crew can be found at the gas station on Redland Road (SW 187 Ave.) and 264th Street in the Redland from Thursday – Sunday each week. Another reason to drive a little farther south in the Redland! My family’s search for really good pizza in Miami has ended. Finally. They’re a little hard to please in the pizza department. The kids were born in NYC, undisputed king of the pizza, and not without merit (many have ventured guesses that it may, in fact, be the water?). So they were a little spoiled when it came to pizza. We’ve been searching for that perfect piece of dough, sauce & cheese combo in Miami for almost eight years. Today I can confidently state that our search is over. We came close once before, but we were in Ft. Myers Beach on vacation so that didn’t count. Don’t get me wrong. We’ve had good pizza in Miami. The kids always sized it up, though, and came to the conclusion “yeah, but it’s not as good as New York pizza.” Alas, when those words were uttered, the search continued. Last week, instead of summing up our new find with those words, they “mmmmm, mmmmm’d” their way through the pie, while rolling their eyes in delight. 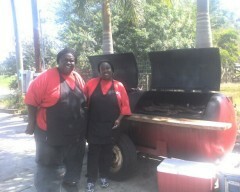 When finished, they proclaimed, “THAT was good!” The best they’ve had in Miami. Period. The winner of their kudos was found in the most unlikely of places. A gas station. Yes, a gas station. 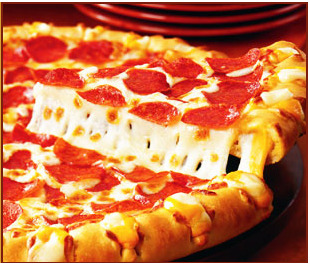 Corrina’s Pizza is located inside the quick-mart at a gas station on Krome Avenue and 272 Street. I don’t even remember which gas station it is. Not important. Corrina’s doesn’t sell just pizza. They’ve got a full line-up of hot subs (including my all-time favorite eggplant parmigiana), baked pasta dishes & Italian dinners. But with such good pizza I’ve yet to make it to that part of the menu. =) I love their Special Deluxe pizza (pepperoni, sausage, mushroom, onion, green pepper, olives & garlic). One slice makes a whole meal. And their prices are pretty darn reasonable. A large pie is $10.95 (and it is large). A slice is $1.95 (I remember paying 35 cents as a kid in NYC…my age is showing). Hot subs are $5.95 while their restaurant counterparts charge $2 or $3 more for the same thing. The dinners are $4.95 – $8.95, again much less than their competitors. So, if you’re lucky enough to live in the Redland / Homestead area, or find yourself taking a drive “out to the country” make sure you stop at Corrina’s for a slice of pizza. They do have a seating area so you can eat it nice & crispy. Even if you live “in the city” it beats a flight up to NYC. *Closed Sundays until football season so plan your visit to the Redland on a Saturday! If you want to eat someplace unique, affordable and delicious, try The White Lion Cafe in Homestead. The White Lion Cafe is more than just a restaurant with good food. It is filled with antiques that spark interest and lively conversations. In addition to the open dining area thats indoors, theres an outdoor area where larger parties can be accommodated. Thats where we sat the last time. The flies had not been invited but they crashed the party anyway. In spite of this, our lunch was most enjoyable and the food scrumptious. I enjoyed a shrimp picatta served with fresh spinach and mushrooms over angel hair pasta. The capers made it just right. At $9.95 I found this most affordable. One item on the menu that I found memorable is touted as the worlds largest PB&J sandwich, big enough for two with a complimentary bottle of Dom Perignon. At $200 I realize the œcomplimentary part is tongue-in-cheek but it gives folks something to laugh about as they peruse the menu trying to select just one item. The dessert selection is made daily on the premises. I had a mango cobbler that I found quite good. It was extremely sweet, but whats a dessert if not sweet? There were 5 or 6 choices so if extra-sweet is not your style, Im sure theres something else youll find enjoyable. The staff at the White Lion Cafe is friendly and the service prompt. We enjoyed a lively conversation with our waitress, particularly when discussing dessert. The White Lion Cafe does have an outdoor bar where you can enjoy a drink and live entertainment on certain nights as well as karaoke on the weekends for those who dare. The White Lion Cafe is located at 146 NW 7 Street in Homestead, just west of Krome Avenue. They are open for lunch and dinner and theres always plenty of parking! I love living and selling real estate in the Miami Redlands. And while there are great places to eat in the Redlands, and I will post about them, I am not posting about a place that is right in the Redlands right now. Latin American Cafeteria has several locations throughout Miami. The closest one to the Redlands is the one on Eureka Drive (Just a few minutes east at 11370 SW 184th Street). I still can’t figure out if all the Miami Latin American restaurants have the same owner or are even related, but the two I’ve eaten at (this one and the one on Sunset) seem to have the same menu and generally the same atmosphere. It’s a no-frills type of place with a large counter and tables. Fill your tummy quickly and pretty cheaply. If you’re ever visiting Miami, make sure you stop at a Latin American Cafeteria. They have Cuban sandwiches not to be missed. Their entrees are mostly between $5-$10. Hungry for breakfast? They have quite a few selections and most won’t set you back more than a few dollars. For only $2.99 you get eggs (tell them how you like ’em), bacon, ham or sausage, tater tots (not typical Cuban fare but still yummy) and toast. Now, get this about the toast: it is not dry (has lots of butter on it) and it is not your traditional white bread. Instead it is a huge piece of Cuban bread that has been split and toasted on the sandwich press. Quite a treat…crunchy and delicious. My kid added a cafe con leche ($1.35) so she could dunk her bread in it. I’m not a dunker. I ate it straight and crunchy. Be prepared to skip lunch if you eat your whole breakfast. If you don’t speak Spanish you may have to work a little harder to order, but it’s totally worth the effort!